Soutache set a stakes record Saturday with a late run that resulted in him beating World of Trouble by a half length in the $200,000 Affirmed Stakes at Gulfstream Park. In the co-feature. Starship Bonita took the lead entering the stretch and then held off Dessert Honeys to win by a nose in the $200,000 Susan’s Girl Stakes. 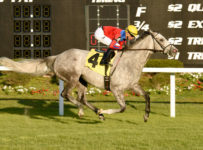 Both races were seven furlongs on dirt and were the second legs in the divisions of the FTBOA Florida Sire Stakes series. Soutache won the Affirmed, for males, in 1:22.46. That broke the stakes record of 1:23.89, set last year by Three Rules. Eric Cancel rode Soutache for trainer Ralph Nicks and owner GoldMark Farm. Starship Bonita won the Susan’s Girl, for fillies, in 1:25.43. Starship Bonita came into the Susan’s Girl as a maiden, after finishing second and fourth in her first two starts. She won the Susan’s Girl at 14-1. Carlos Montalvo rode Starship Bonita for trainer Steve Dwoskin and owner Starship Stables. Pjantom Ro finished third in the Affirmed and Go Astray finished third in the Susan’s Girl. On Aug. 5 at Gulfstream, Pantom Ro won the $100,000 Dr. Fager and Go Astray won the $100,000 Desert Vixen. Those opening leg Sire Stakes races were six furlongs on dirt. The annual series will conclude at Gulfstream on Sept. 30–with the $400,000 In Reality for males and the $400,000 My Dear Girl for fillies. Both races are 1 1/16 miles on dirt.